This week a very different kind of conversation on the Recommended Dose – one that considers the art of medicine more than the science. 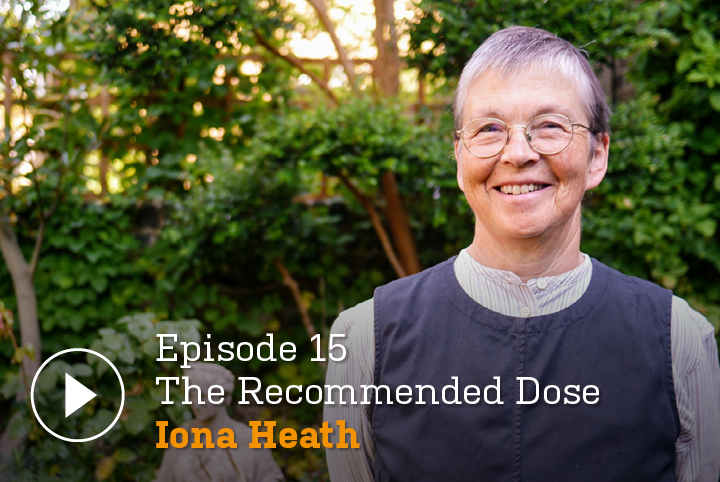 Iona Heath is a long-time family doctor who has worked in a London GP clinic for over 30 years, and at one time became President of the Royal College of General Practitioners. With an international profile, gained in part through her much-loved writing in the BMJ, Iona is unlike many of our previous guests. For a start, she loves words more than numbers, and literature more than clinical guidelines. Host Ray Moynihan caught up with Iona at a recent conference in Helsinki – where she'd just presented little data but much food for thought from the likes of novelists EM Forster and James Baldwin. Here, she shares more of her love of literature and thoughtful commitment to the best kind of patient care. Listen on Soundcloud or Google Podcasts. Ray Moynihan: Today a very different kind of conversation on The Recommended Dose. Much more about the art of medicine, not the science. Hello. I'm Ray Moynihan and welcome to the podcast promoting a more questioning approach to healthcare. Produced by Cochrane Australia, and co-published with the BMJ. My friend and colleague, Iona Heath is a long time family doctor. She's worked for decades as a GP in a practice in London and she's gained an international profile in part through her much-loved writing in the BMJ. Unlike many guests, Iona Heath loves words more than numbers, and literature more than clinical guidelines. We caught up during a recent conference in Helsinki, where her presentation had very little data, but was very rich with quotes from the likes of novelists including E.M Forster and James Baldwin. In a profile in the BMJ, I think you summarise your personality in three words. You said lucky three times. Ray Moynihan: Why did you say that? Iona Heath: Because I feel that I've been immensely fortunate in my life. Particularly when I think about the previous generations’ lives blighted by the war, I've been incredibly fortunate. Classic baby boomer… but very lucky in my relationship, my children and then my career. And the fact that I worked for 35 years in such an interesting practice with such wonderfully supportive colleagues with absolutely fascinating patients. Ray Moynihan: I think you were asked who would you like to thank most for what's happened in your life and I think you said you wanted to thank your patients. Why did you say that? Iona Heath: They taught me more than anything. For example, the patient who taught me that you have to just sit and listen was this wonderful, very deprived, very damaged woman from Ireland who had an alcohol problem and a handicapped child and multiple suicide attempts. She taught me that. I'm going to come here and she would tell me what was happening, and if I interrupted her she wouldn't comment - she would just go back to the beginning of the story and start again. I very quickly learned, do not interrupt this woman because otherwise you're going to be here all day. You just went back to the beginning and she just doesn't give… because she had it in her mind, the story she was going to tell. And she just lost her flow if I interrupted. Ray Moynihan: Why is it important for clinicians to listen more? Iona Heath: Because all the clues are there. All the clues are there about the way somebody tells their story. When I was first working hospital, I did one year in hospital, but I was checking a man who'd had a heart attack that morning. And he was telling me this story and he was telling me what time he got up, every single thing he'd had for breakfast, what the weather was like. In my arrogant youth, I was incredibly irritated by this and wanted him to get to the point. And of course, he was trying to point a clue to me about why this has happened now. That he knew that somewhere in his story was the critical event that had made it happen then. Neither of us knew what the answer was. But he thought that I might have a chance of knowing what it was if he told me every detail, which is perfectly fair enough. We don't listen nearly enough because all new knowledge is in the patient experience. And if we don't listen to it on the basis of the knowledge we already have, we're going to miss all the knowledge we might get. Ray Moynihan: Do you think people came to you enjoyed seeing you as a GP, as a family physician, because you knew how to listen? Iona Heath: I'm sure that's part of it. And I'm sure there are patients who said, "Well, she never listened at all." If you see what I mean. But I did try to listen and try not to interrupt. Ray Moynihan: What else was different about the way you practice? I have to confess that I often think if I was living in London, and you were available as a GP, I would have wanted to go and see you as my family physician. Iona Heath: That's very kind. Ray Moynihan: I imagine you would have been fantastic, but what was it, what was different about the way Iona Heath practiced as a GP? Ray Moynihan: There was a connection. Ray Moynihan: I guess, I'm thinking that you have this huge profile as someone who has spoken up about the dangers of medicalisation for decades. Now, that must have affected the way you practice on a day to day basis with your patients, the people that saw you. Iona Heath: Yes. And I think you have to be very, very careful to guard against nihilism. Ray Moynihan: What do you mean by nihilism? Iona Heath: Therapeutic nihilism is nothing works, why bother? You know, life is short and brutish, and we're all going to end in the grave. You have to be very careful that you make the best of modern medicine available to people with all the caveats. Ray Moynihan: While you're very aware of the limits of medicine, you are also aware of the benefits, aren't you? Ray Moynihan: You mean from the popular newspapers? Iona Heath: The popular newspapers. Really, don't ask me to give you anything new, just wait two or three years because we never know, and new medications can be dangerous. So I tried to introduce that bit of caution. Ray Moynihan: Did you see a change in the decades that you were practicing, people consulting the internet more, getting more informed, bringing that information into the interaction with you? Ray Moynihan: Did you think that was a good thing? Iona Heath: I thought that was a good thing. When you're confronted with 50 pages, that's a little disempowering. But I thought, by and large, that's a good thing. I like people with lists. I love lists. People complain about lists when people bring in the list. I love the ones that have carrots, potatoes and onions down side, where they've written their shopping list and their doctor list on the same thing. I really like that. Ray Moynihan: Another thing that I've found when myself or a loved one is in need of care, is this idea of going to the doctor as a group. So, not just coming as an individual patient, but coming with your sister or your mum or your best friend or two friends. Particularly, if it's a serious issue. Iona Heath: That's great. That's really great. Particularly because I'm working with a multi-language, multi-ethnic group. So, often you needed that to have any degree of comprehension about what was going on. Ray Moynihan: Apart from being a GP, you also developed a bit of a career as a doctor politician. You rose to the height of the president of the Royal College of General Practitioners. Iona Heath: Well, that process started entirely by accident. In 1989, they threatened to suspend all training in my region of the country because the powers that be disapproved of the guy who was running the training quite rightly, they disapproved, but they were going to just punish all the trainees by rendering their training invalid. So, we were all furious, and I went to a meeting, drove out to East London somewhere. I went to a meeting and listened all these platitudes about a standard is a standard is a standard. And I came back and I was more angry than when I went to the meeting. I read in the college journal that if you stood in the national ballot to be on the Council of the Royal College, you could make a 50 word statement that will be delivered to all the membership. So, I wrote this rant, 50 words ... You can't rant very much in 50 words. But I ranted about how out of touch they were with a real world. I had no idea it was so easy to get elected. I topped the ballot by a substantial vote and never looked back really, because I never realised that you could get involved quite so easily. Ray Moynihan: Let's talk a bit about evidence. And the way into talking about that, let's talk about shared decision making. This new wave that's coming through medicine now. Would you say that you practiced shared decision making? What do you think about this idea of shared decision making? Iona Heath: If I'm really honest, I'm not quite sure I really understand what it is. I've been very impressed by Annemarie Mol's book on the logic of care. She contrasts it with the logic of choice. And she says that the capitalist model is a series of nodules where you make a choice, a binary choice. And that's how capitalism works and sells you things. But actually in the logic of care, the caring dyad are experiencing things together, and choice emerges. It isn't a nodular thing. Choice emerges ... She is this Dutch philosopher who observed diabetic clinics in Holland. And that's my experience, is that choice emerges that decisions emerge within continuing a therapeutic relationship. But obviously, you have to allow them to emerge. They're not going to emerge if you close off some options before the patient has even had a chance to notice that there was an option. So I think it has to be a broad approach to what choices there might be. One of my Norwegian friends says that you must always answer the question what would you do doctor? You have to caveat it by saying, my life is different, your decision might well be very different from mine, but I would do this. Because that then delineates a decision space. And the other thing about shared decision making that I think is a danger is the offloading of guilt when things go wrong. And that one of the moral responsibilities of doctors is actually to share that guilt. If somebody is facing a really difficult decision, if you offer them, if I were you I'd do this. When they're desperate for some sort of help, then if it goes wrong, then they can say, it's the doctor’s fault, and it's not my fault. They don't have to live with that forever. The illustration again, was told to me by a Norwegian friend who was rung in remote Western Norway, rung from the main hospital in Oslo by young parents who just had a baby with a serious heart condition. Norway is a rich country. The child was going to die unless it had major cardiac surgery of a type that wasn't done in Norway then, and they said, "You must decide this child is going to die. The child may die anyway. But if you want the operation, we have the funds to fly you to America. But you have to decide." So, they phoned the GP in their deep west of Norway. And he listened to all this and he said, "I think you should bring the baby home." Then he's taken that guilt, the weight of that decision away from them. I think we underestimate the importance of sharing the bad decisions as well as the good decisions. Shared decision making makes it such a complicated area, sounds so simple. And in the really important cases, it's not simple. Ray Moynihan: Again, you're really trying to bring the relationship, the human relationship between the doctor and the patient, or the person. You're putting that front and centre aren't you? Ray Moynihan: Let's talk about evidence. This program talks a lot about evidence, trying to create a more questioning approach to healthcare, and using evidence to do that. I think you have a bit of a different view about evidence than a lot of the people we've spoken to. When you hear the term evidence based medicine, what do you think? Iona Heath: I think it's a noble aspiration. And I think that we need to keep pursuing it. But I think that we've got a real problem with the corruption of the evidence. Because if you lose the trust of the generation of clinicians, frontline clinicians by corrupting the evidence so that they do things that they perceive has harmed their patients, then you're in real problem with the science. Corrupted science, how'd you regain that trust? How do you distinguish bad evidence from good evidence? Who can you trust. Ray Moynihan: But I don't think you just think that the problem with evidence is because of the corruption of the evidence. I think it's deeper than that, is it not? You've written that evidence based medicine tempts us to describe people in terms of data and numbers from biomedicine… and that will never be enough. Iona Heath: That's true. That's true. And I do have a real argument with numbers versus words, because the old case descriptions of patients, beautifully written, nuanced, subtle descriptions of people in their conditions. What have we lost when we reduce that to a number? I think the worst thing that's happened in the course of my career is the separation of diagnosis from symptoms. So, where I was always taught that there's lots of illness without disease, but there's almost no disease without illness. We've completely flipped that round. Now, there is an epidemic of disease without illness. Where people are just told that their numbers are wrong and therefore they're ill. That didn't exist in the early 1970s, and it's just taken off. What have we done? What good does that do the world? Ray Moynihan: In other words when you started you were much more focused on helping sick people. Iona Heath: You're overwhelmed... the sick people can't get in the door because the well are in and they're getting this, that and the other checked all the time. Ray Moynihan: That's why you have this concern about preventive medicine is it? Iona Heath: Yes because I think that the great moments of public health, the great progressive moments are at a distance from the patient. They're health protection, they're stopping smoking in public spaces. They're not nagging individual smokers every hour of every day. They're stopping smoking in public spaces, they're introducing seat belts and speed limits and stopping people smashing themselves up on our roads. In Scandinavia, they're having a decent social equity policy so that there's a proper safety net and people are not living deprived and undignified lives while watching the others water skiing or whatever. Ray Moynihan: They're the preventive public health measures that you like. Iona Heath: Yes. They've been completely sidelined by this whole thing about lifestyle disease and doing all the prevention at the level of the individual, which turns into a simple exercise in victim blaming as far as I'm concerned. There's nobody nowadays that doesn't know that it's dangerous to smoke, nobody. They smoke because they can't get through the day without it. People don't do these things just because they're feckless and stupid, but you'd think from a lot of the lifestyle rhetoric that that's how it was. Social justice is the biggest promoter of good health in the population than any drug. Ray Moynihan: This is related, I think, to your concern about guidelines. A lot of the people that we talked to on this program are promoting the idea of evidence based guidelines that will influence medical practice, that will guide doctors in the decisions they make, that can inform people about the risks and benefits of treatments. But you have a different view about guidelines, don't you? Iona Heath: Well, speaking as somebody who's trying to see a different patient every 10 minutes and maybe seeing 40 in a day. One of the troubles guidelines is they start with diagnosis. Ok so that's well down the process, particularly in primary care. You want to actually keep people away from diagnoses as long as you can, because that improves your chances of getting the diagnosis right in the end. If you make a diagnosis within two minutes, unless it's something barn door you're probably going to get it wrong. So, you need to take your time and just slow, slow medicine. Slow medicine is good. That's one of the problems. The other is just the sheer volume of guidelines. It's ludicrous. Nobody could read them all. Not even the biggest guideline enthusiast could read all the guidelines available. Life is too short. Iona Heath: I used one (laughs). I did use one regularly. But I did try to ... I have always tried to keep up with the literature. One of my worries about systematic reviews, and this is very un-Cochrane. Because an individual paper, I know how to critique. Now, I know what to look for, I know what the patient group is, I know who's being excluded, roughly. I can look at that single paper and I can decide whether this is relevant to this particular patient or not. Systematic review, you have to trust the systematic reviewers. There's no way that you can make a professional judgment about the relevance of this piece of information to my patient. Ray Moynihan: I mean there are ways of critiquing the reliability of a systematic review, but you're saying that the average GP might not have time for that. Iona Heath: You might not have time for that. And the particular challenge for the GP is not the robustness of the evidence, it's… there is a recent brilliant Trish Greenhalgh’s paper - it's deciding whether the evidence has something to offer to this particular patient. So, there's the issue about the evidence missing the mark, there's the issue about how much we can trust the evidence. And then there's the sheer volume of the evidence. I think it's absolutely important that you know the evidence around the common things that we see, and that you know the evidence about the dangerous thinks that are likely to turn up in primary care. Ray Moynihan: Am I right in saying that instead of championing numbers and evidence, you would champion words and literature? Iona Heath: I would. I mean obviously, there's a place for numbers. But if I think about probably, one of the most sensational shifts of evidence of so-called evidence in my career was the cot death thing. When I started, we were telling everybody put their children on their tummies, and I did that with both my kids - thank god they survived. And now, we know that that's associated with a higher rate of cot death. And we had three cot deaths in a week in my practice. It was really traumatic. That was a really good piece of research that changed practice and saved lives. I don't think ... There's not that many papers that you can say that about. Ray Moynihan: But you do value words and you do value literature a lot don't you? Iona Heath: I do value words and literature, yes. Ray Moynihan: ...some novelist or James Baldwin. It's very powerful and very affecting. How do you see literature informing the practice of medicine? Iona Heath: Because the whole of life is about words, we learn how to be ill, we learn how to relate to the world with words, not with numbers, we relate to the world with words. We learn about words in relationship with each other. We learn about what it is to be ill through words, and we learn what it is to feel well with words. And we need words. The listening to the words of the patient at the beginning of an illness episode is absolutely crucial. So why don't we pay more attention to those whose genius is the use of words - novelists, poets, et cetera? Iona Heath: Exactly. Sociologists, people who ... as Seamus Heaney writes it, he puts that the world is different after it has been described by a Shakespeare and Emily Dickinso … It's not quite the right quote, but the world is changed. You do see the world differently once you've read certain authors. So take an Australian, I never forget reading Tim Winton's Cloud Street when I was a fairly early on in practice. Suddenly, all my patients were quite as crazy as the population of Cloud Street. But it made us see them as such endearing characters. It's definitely helped me survive to see parallels between what I read apparently for recreation, I see parallels with my work and I found that incredibly enriching and informative, and I've learned a lot from those sorts of insights. Ray Moynihan: You think it benefited your patients? Iona Heath: Oh, yes. Oh I think so. Ray Moynihan: You've also benefited us because you suggested that I read a book by Sarah Moss, the great British novelist, living British novelist, young British novelist. We ultimately interviewed her on this podcast. That was an extraordinary conversation. She, of course, writes about medical matters, often historical. So, thank you very much for that. Iona Heath: Well, I was amazed by her. Yes. I heard her speaking at a literary event. That's another person you should interview. You should interview Sam Guglani, who runs Medicine Unboxed. Ray Moynihan: All right. We'll take that one on board. Before we wind up, just a little bit about you and your family. I think there's three generations in your family now. You're enjoying not just being a parent, but also being a grandparent. Is that right? Ray Moynihan: I bet he's a great grandfather. Iona Heath: He is a great grandfather. So we've got a son and a daughter, and each of them have two daughters. So, we have four granddaughters. We have a monstrous regiment of women in the development stage. Ray Moynihan: Do you have your regular day with them or it's not that organised? Iona Heath: Our son's moved away to Bristol. So, we see them more intensely at bigger intervals. And then we see the other two once a week. Ray Moynihan: I know that you travel a lot these days since you've kind of semi-retired. You always seem to be jetting around somewhere. Iona Heath: Well, it's quite wonderful to have been involved in international general practice. And it is also quite wonderful how you can talk to general practitioners around the world. And we have so much shared common experience at the front line of generalists practice, that you can be on the same wavelength with people very ... So I have GP friends, family medicine friends all over the world. And it's such a delight. Ray Moynihan: What a privilege. Iona Heath: It's a joy. It's a great joy. Love and wonder, James Baldwin. Ray Moynihan: Pleasure to talk to you Iona. Iona Heath: Pleasure to be here Ray. Ray Moynihan: That was a conversation with Dr Iona Heath, recorded at the Too Much Medicine Meeting in Helsinki. Thanks to Shauna Hurley and Cochrane Australia for production, BMJ for co-publishing, and Jan Muths for editing. If you enjoyed The Dose, and thanks to all of you who've told us you do, please rate us or recommend us, or not. And coming soon, a Grand Prix loving, music festival going, evidence informed guru with some sublime music from Scotland thrown in.